This pilot study investigates six interactive sonifications of accelerometer data in the context of outdoor sports activities. The designs investigate different techniques and theories of sonification. Through this study we also trial and develop mobile technologies for interactive sonification, and a ‘technology probe’ methodology for research in outdoor sporting situations. 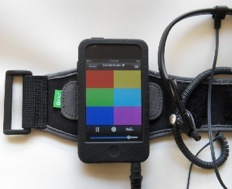 The sonifications were synthesised in realtime on an Apple iPod touch from the onboard accelerometers. In trials the selections between sonifications were recorded on the device. Participants were not given any specific tasks and tried it out in various activities that included walking, jogging, martial arts, yoga and dance moves. 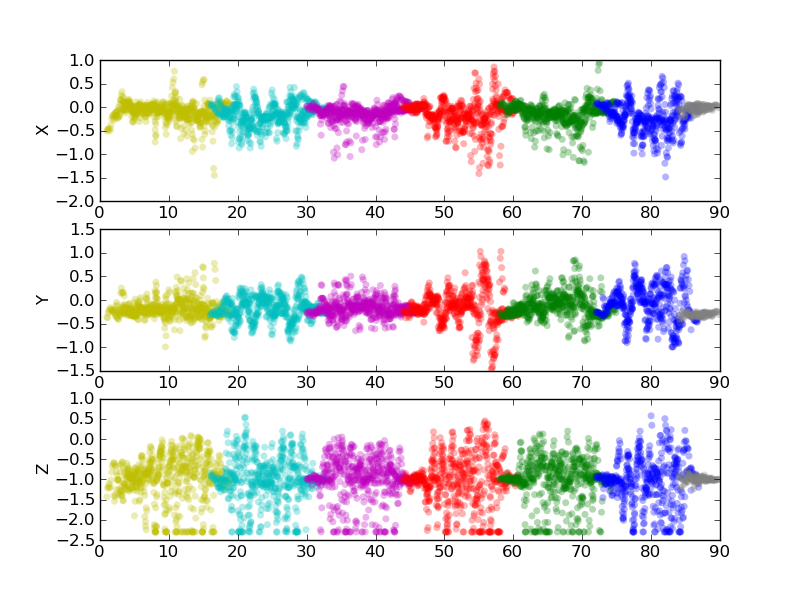 The plot shows X, Y, Z acceleration while walking up and down a flight of stairs coloured by the choice of sonification. sinification – a design pattern that maps a continuous parameter to the pitch of a sine wave which has been used over and over again in sonifications of different kinds of data. formants – maps acceleration in x,y,z directions into a 3D timbre space of a speech formant synthesizer. Different vowel-like sounds distinguish different directions so that positive acceleration in the y-axis produces a different vowel than a negative acceleration. This design has the advantage that positive acceleration sounds different from negative acceleration. stream-based – this design uses the theory of auditory scene analysis to draw listening attention to repeating patterns in the acceleration over time using figure/ground gestalt. This approach highlights rhythmic or repetitive actions, and may aid synchronization. weather metaphor – the metaphor of the wind blowing aids comprehension. The lack of acceleration, or zero, is heard by a lack of wind, which is something that you can’t hear in the sinification. Additional information about jerkiness is conveyed by a roll of thunder. musification – a more complex example of algorithmic music that includes some narrative and compositional structure. Real-time analysis of turning points, zero crossings, and derivatives of the acceleration influence the synthesis and sequencing of six FM instruments that include a drum-machine. algorithmic music – the acceleration in the x,y,z axes controls three FM synthesis instruments so it sounds like improvisational ambient electronic music. A many-to-many mapping between acceleration and sound has been designed for musical effect. The generated music is influenced by the data but the informational content is not necessarily clear. Barrass, S., Schaffert, N., Barrass, T. (2010) Probing Preferences between Six Interactive Sonifications Designed for Recreational Sports, Health and Fitness, in Proceedings of ISon 2010, 3rd Interactive Sonification Workshop, KTH, Stockholm, Sweden, April 7, 2010.